Let yourself be seduced by the chic and charm which emerge from Hotel Bakoua: made up of several buildings, with a Créole inspiration, this 4-star property at Trois-Ilets has been able to preserve the elegance of majestic colonial mansions with their warm and vivid colours for a highly sophisticated and convivial rendering. 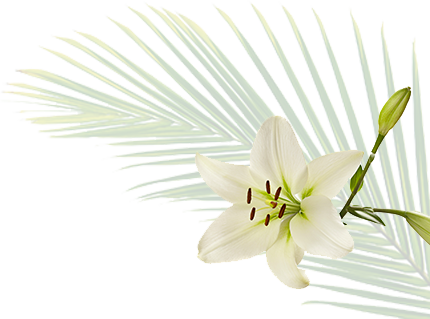 Each room or suite has a terrace or a balcony, so that you can enjoy the stunning view of the Flamands bay and the tropical garden in which the hotel is nestling. 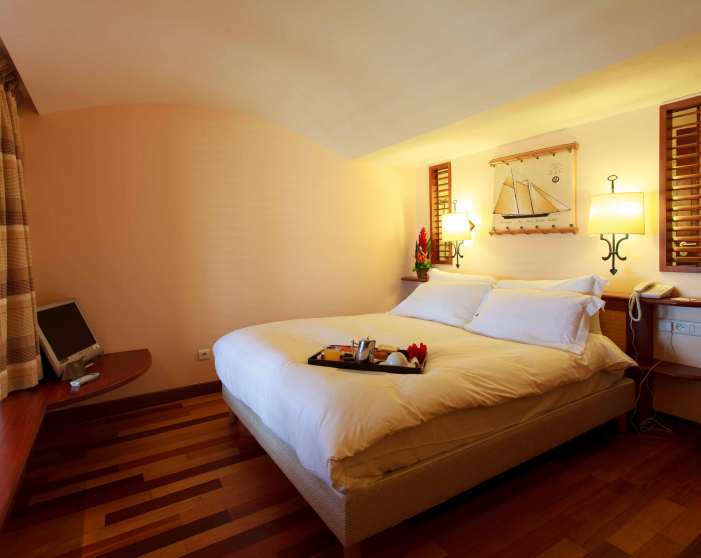 Ideally located by the sea, you are welcomed in one of its 138 rooms or suites, with upscale comfort. 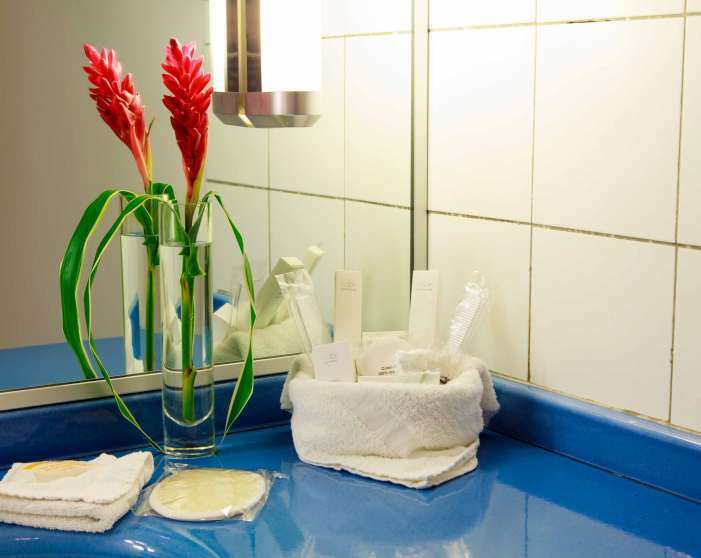 Discover Martinique and its splendours, comfortably residing at Hotel Bakoua, which invites you to a trip placed under the sign of relaxation and wellness, during your romantic stay, as a family, thanks to communicating rooms or during a professional trip. 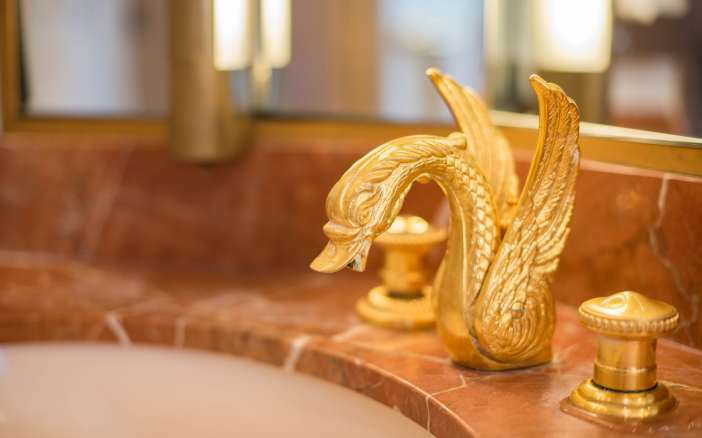 Immerse yourself in the exceptional universe of the Joséphine suite (homage to the Bonaparte Empress, born at Trois Ilets): luxury, calm and exquisite delights prevail in this romantic place with a cosy atmosphere, which will be the ideal setting for your stay as a couple or your honeymoon in Martinique. With a subtle mix of mahogany furniture and heavenly blue colours, it boasts a sophisticated decor which is reminiscent of the majestic mansions of the colonial era. Set back compared to the other rooms of Bakoua Hotel, it offers an appreciable intimacy for a confidential stay at Trois-Ilets. Its upscale comfort is on a par with the prestigious ambiance to turn your stay in this 4-star property into a unique moment. 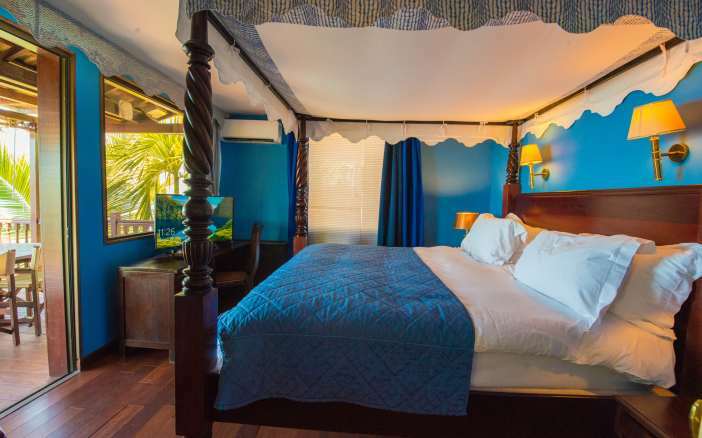 It has private access to the beach, a separate entrance, a bay window with terrace and panorama view of the bay of Fort-de-France, a room with a four poster king size bed, a lounge, a bathroom with separate shower and angular jacuzzi bathtub, a 20m2 terrace, with deckchairs and a teak table for four persons. 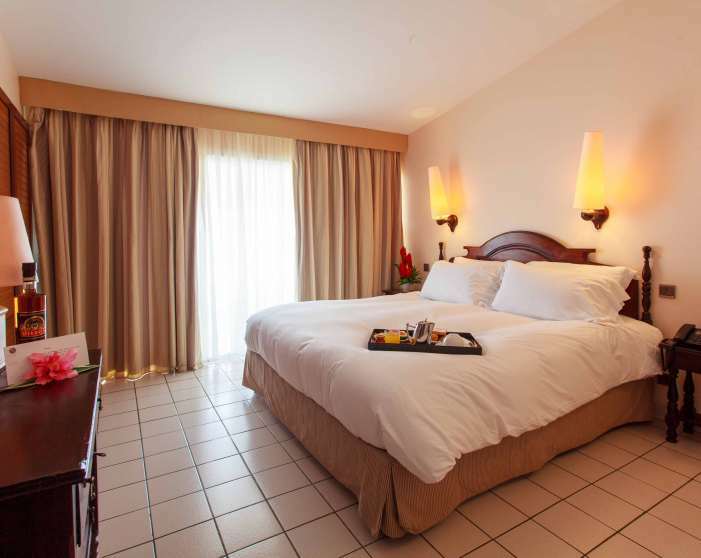 The suites welcome you to a romantic . 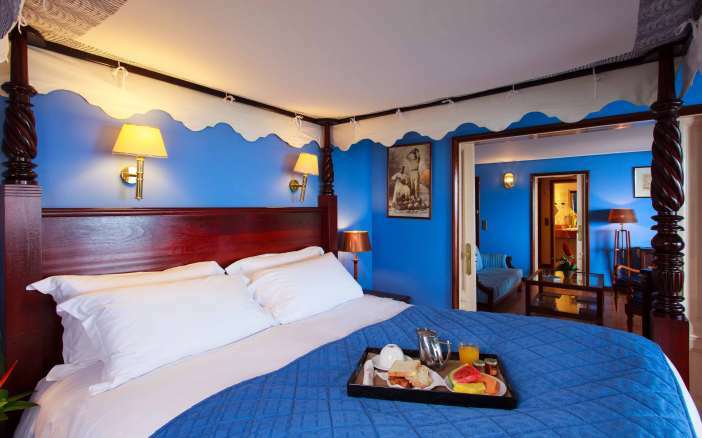 Their classical decoration inspired by the colonial era is a mix of stylish furniture, made of wood, colourful fabrics and white walls, providing these suites with a cool, chic and cosy elegance. 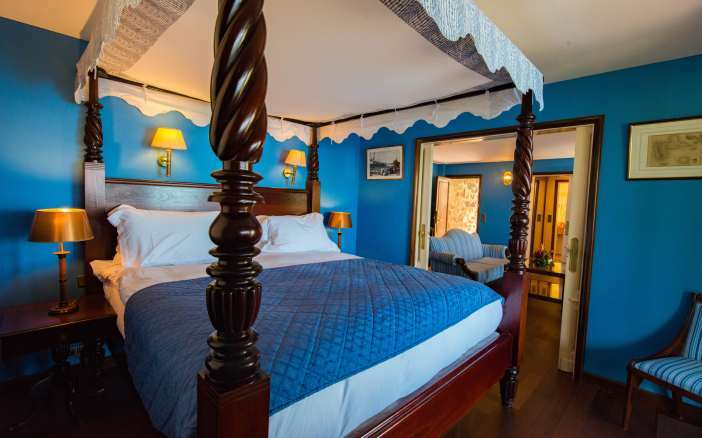 They have a double room with king size bed, a lounge with sliding doors, a bathroom with separate shower, a large walk-in wardrobe and an exterior terrace with a view of the bay of Fort-de-France. They will meet all your expectations during a romantic stay but also during a business trip, thanks to their large area and their upscale comfort. 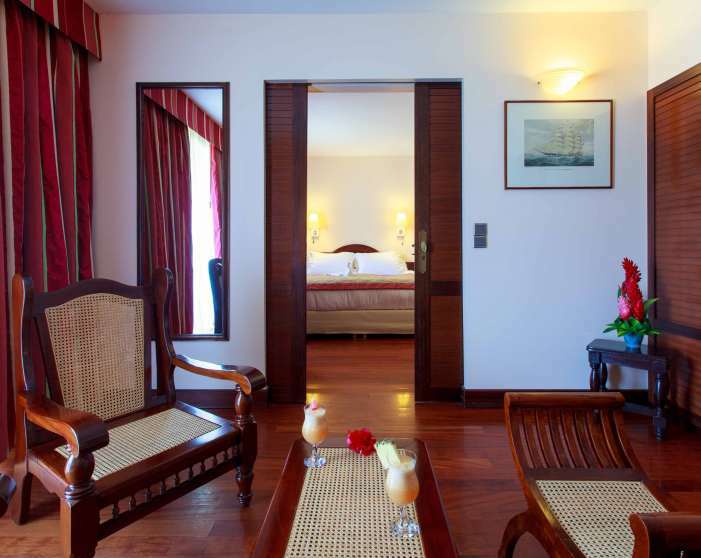 Opt for these deluxe double rooms with a direct access to the white sand beach and a breath-taking view of the sea. 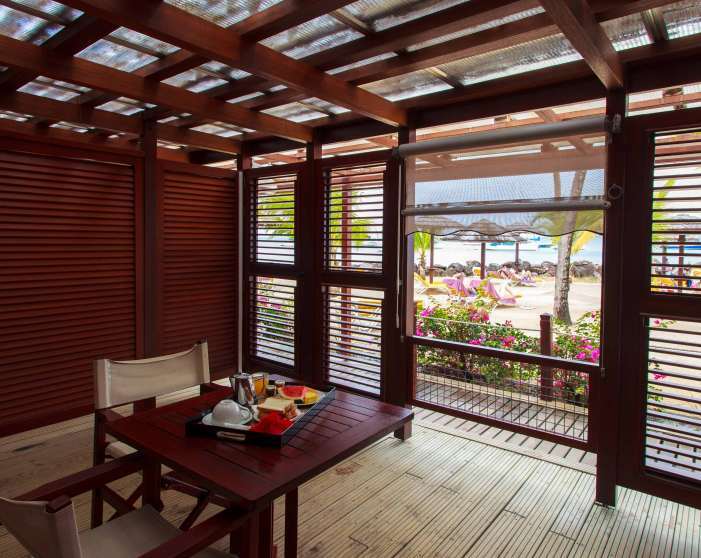 Enjoy the privileged location of the 4-star Hotel Bakoua, during a successful stay in Martinique. With an area of 32 m2, these rooms are decorated with charm and elegance: soft light, elegant furniture and decked and shadowy terrace to relax in all privacy. 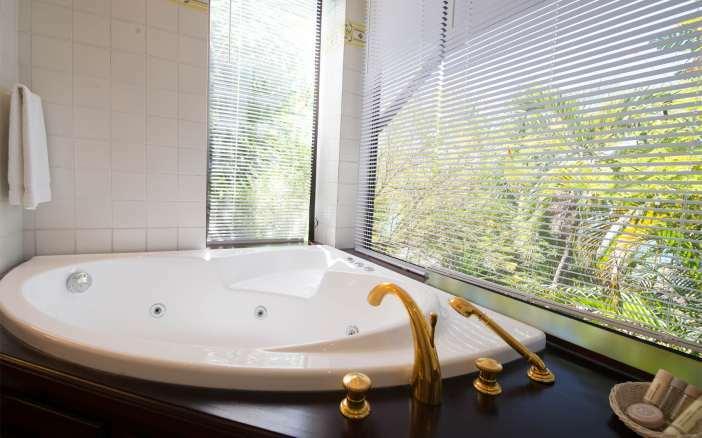 They have a large double king size bed, a desk and a bathroom with bathtub. 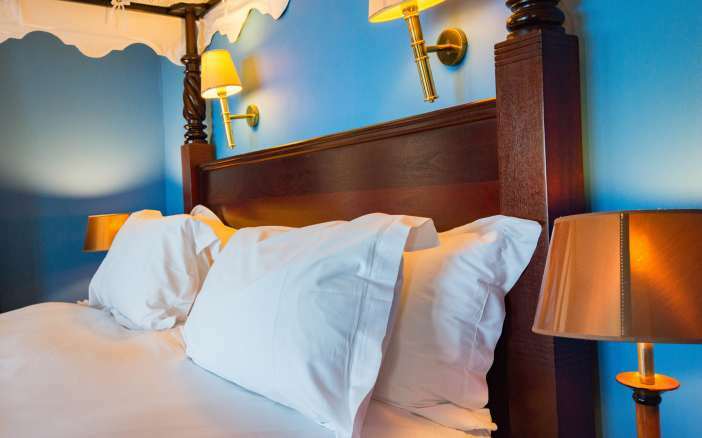 Cosy, private and intimate ambiance are the characteristic features of the privilege rooms. 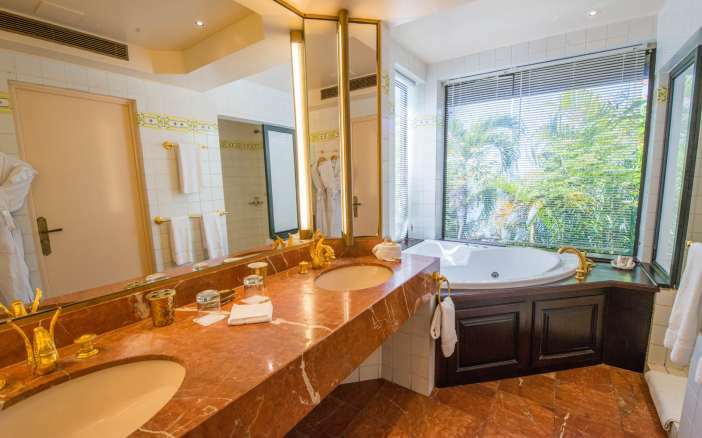 They are spacious and boast a terrace, with panoramic view of the bay of Fort-de-France: enjoy a serene decor, in a green oasis within the tropical garden to offer yourself a calm stay. 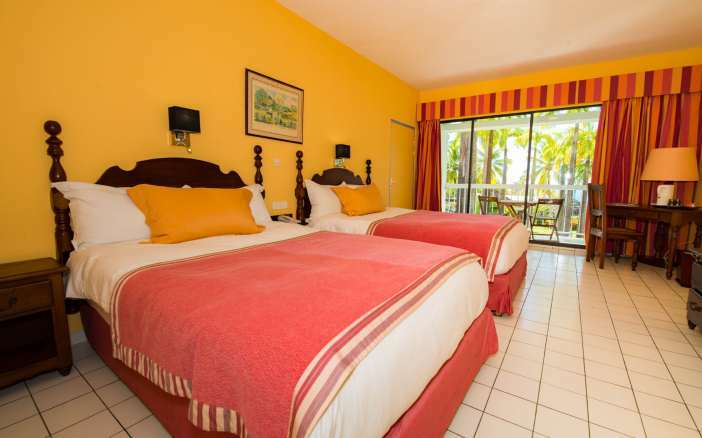 They have a king size bed, a bathroom with bathtub and a terrace with a sea view. 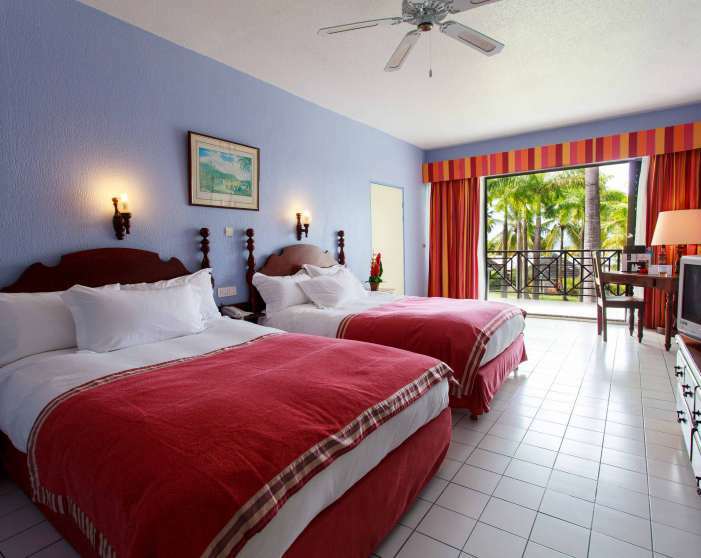 These superior rooms have full comfort and a high quality decor. 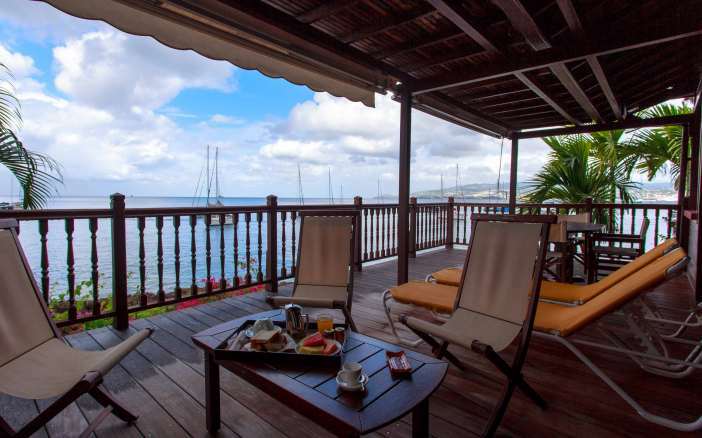 With an area of 28 m2, they welcome you to a stay at Trois Ilets, in an exceptional natural setting, facing the bay of Fort-de-France. 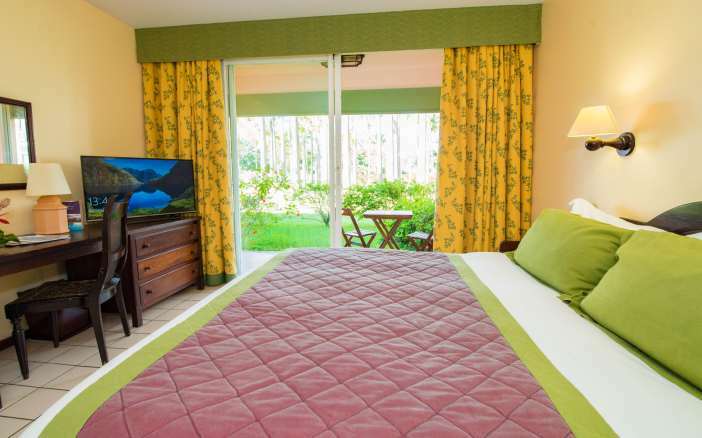 Discover these rooms which offer you an equipped balcony and a pleasant view of a lush tropical garden. 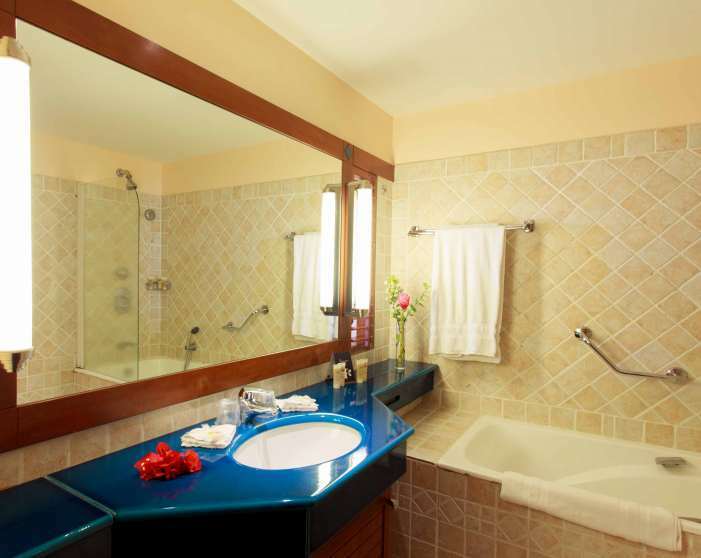 They also have a double king size bed, a private bathroom with bathtub. 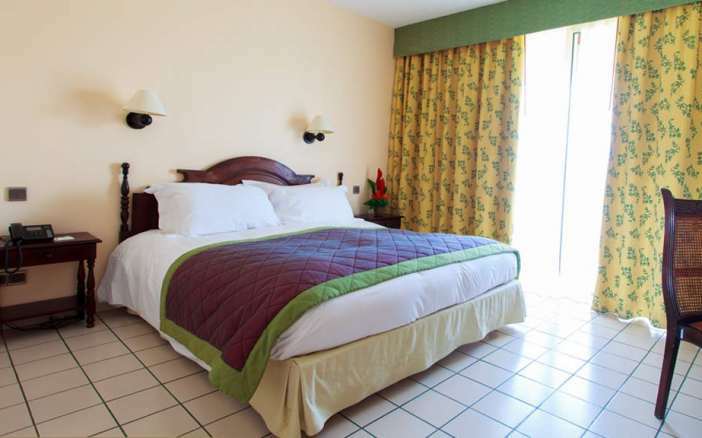 Opt for these double superior rooms during your family stay at Hotel Bakoua. They have two large double rooms and a large area to allow you to stay with a group and benefit from the gentle lifestyle prevailing in this 4-star property at Trois-Ilets.